On Wednesday, satellite imagery picked up over 600 fire hot spots across Sumatra, with the worst areas being the Jambi, South Sumatra, and Riau provinces. The fires in Jambi are so bad that they have had to close schools. Another big concern in Jambi is that fires are threatening oil pipes that run through the forests there. Half of the fires along the pipelines have been put out, but the other half are still burning. In Riau, helicopters that were water-bombing the fires had to stop because their operating licenses expired. Now, they are having to rely solely on land-based firefighting. 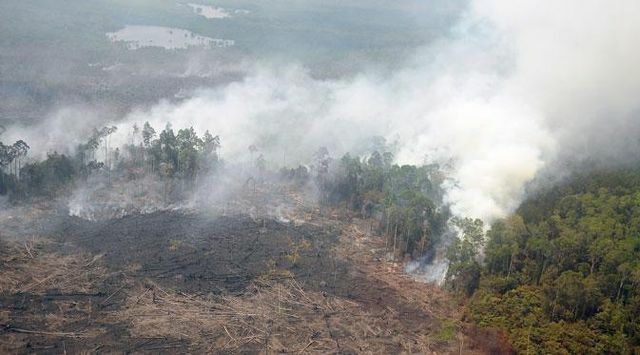 Kalimantan is also experiencing a high number of fires. In both Kalimantan and Sumatra, airports have closed. Experts are saying that fires will be worse this year than the past couple of years because of a drought, thanks to the El Niño weather pattern this year. We’re actually recommending two news articles. You can read them here and here. Pray for the millions of people living near where the fires are burning. Pray for safety and health, and for workers to be able to share the Gospel because of this.